, an English poet and divine, was born at Hatherlagh in Devonshire, in 1604. He received his education at Westminster-school; and was afterwards removed to Christ-church in Oxford, when he was about twenty. He took his bachelor and master of arts degrees in the regular way; and then, entering into holy orders, was presented by his college to the vicarages of Cassington, near Woodstock, and of Pyrton, near Watlington in Oxfordshire. He became, says W T ood, “a quaint preacher, and a noted poet;” and, in the latter capacity, distinguished himself by the production of two plays, entitled “The City Match,” a comedy; and “The Amorous War,” a tragi-comedy. When the rebellion broke out, and Charles I. was obliged to keep his court at Oxford, to avoid being exposed to the resentment of the populace in London, where tumults then prevailed, Dr. Mayne was one of those divines who were appointed to preach before his majesty. In 1646, he was created a doctor of divinity; and the year after, printed a sermon at Oxford, “Against false prophets,” upon Ezek. xxii. 26. which occasioned a dispute between him and the memorable antagonist of Chillingworth, Mr. Cheynell. 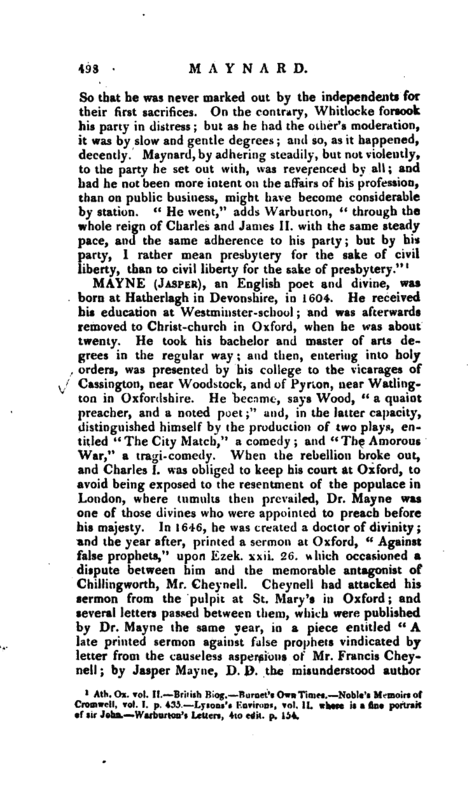 Cheynell had attacked his sermon from the pulpit at St. Mary’s in Oxford; and several letters passed between them, which were published by Dr. Mayne the same year, in a piece entitled “A late printed sermon against false prophets vindicated by letter from the causeless aspersions of Mr. Francis Cheynell; by Jasper Mayne, D. D. the misunderstood author | of it.” Mayne having said, in one of his letters to Cheynell, that “God, upon a true repentance, is not so fatally tied to the spindle of absolute reprobation, as not to keep his promise, and seal merciful pardons;‘’ Cheynell animadverted upon him in the following terms:” Sir, Reprobatio est tremendum mysterium. How dare you jet upon such a subject, at the thought of which each Christian trembles? Can any man repent, that is given up to a reprobate mind and impenitent heart? And is not every man finally impenitent, save those few to whom God gives repentance freely, powerfully, effectually? See what it is for a man to come from Ben Jonson or Lucian, to treat immediately of the high and stupendous mysteries of religion. The Lord God pardon this wicked thought of your heart, that you may not perish in the bond of iniquity and gall of bitterness. Be pleased to study the ixth chapter to the Romans.“The same year Mayne published also another piece, entitled,” OXAOMAXIAj or, the people’s war examined according to the principles of scripture and reason, in two of the most plausible pretences of it. 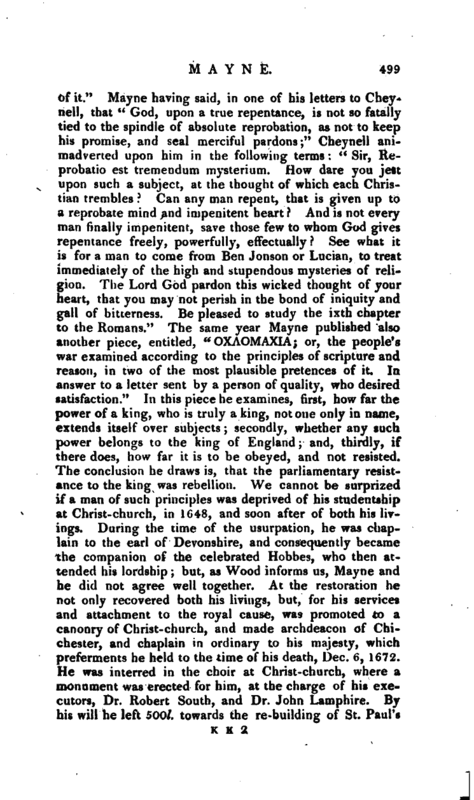 ID answer to a letter sent by a person of quality, who desired satisfaction.“In this piece he examines, first, how far the power of a king, who is truly a king, not one only in name, extends itself over subjects; secondly, whether any such power belongs to the king of England; and, thirdly, if there does, how far it is to be obeyed, and not resisted. The conclusion he draws is, that the parliamentary resistance to the king was rebellion. We cannot be surprized if a man of such principles was deprived of his studentship at Christ-church, in 1648, and soon after of both his livings. 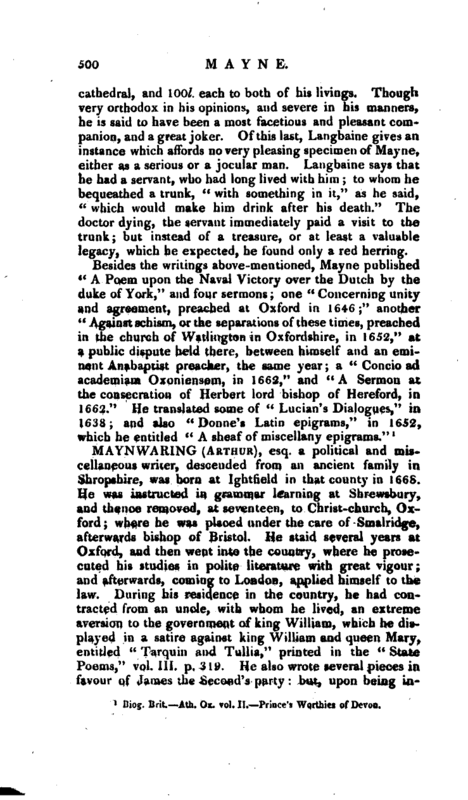 During the time of the usurpation, he was chaplain to the earl of Devonshire, and consequently became the companion of the celebrated Hobbes, who then attended his lordship; but, as Wood informs us, Mayne and he did not agree well together. At the restoration he not only recovered both his livings, but, for his services and attachment to the royal cause, was promoted to a canonry of Christ-church, and made archdeacon of Chichester, and chaplain in ordinary to his majesty, which preferments he held to the time of his death, Dec. 6, 1672. He was interred in the choir at Christ-church, where a monument was erected for him, at the charge of his executors, Dr. Robert South, and Dr. John Lamphire. By his will he left 500l. towards the re-building of St. Paul’s | cathedral, and lOOl each to both of his livings. Though very orthodox in his opinions, and severe in his manners, he is said to have been a most facetious and pleasant companion, and a great joker. Of this last, Langbaine gives an instance which affords no very pleasing specimen of Mayne, either as a serious or a jocular man. Langbaine says that he had a servant, who had long lived with him; to whom he bequeathed a trunk,” with something in it,“as he said,” which would make him drink after his death." The doctor dying, the servant immediately paid a visit to the trunk; but instead of a treasure, or at least a valuable legacy, which he expected, he found Only a red herring. Biog. Brit. —Ath, Ox. vol. II. Prince’s Worthies of Devon.